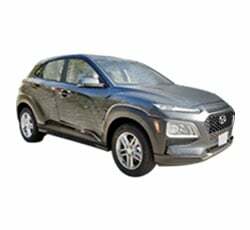 If you've been considering an all-electric vehicle, you've likely been thinking about Hyundai's Kona subcompact crossover since it debuted as a 2018 model. Even if you prefer a traditional gas-powered vehicle, you're probably intrigued by the fact that the Kona was named as the best subcompact SUV of 2018 by U.S. News and World Report and received Car and Driver's prestigious Editor's Choice award. The Kona slots into the Hyundai lineup below the Tucson, Santa Fe, and Santa Fe Sport as the brand's smallest utility vehicle, dubbed as a "crossover utility." This SUV has seating for up to five passengers, including two LATCH connectors for child safety seats. Now in its second year, here's what you need to know about the car that's making waves in the auto industry. New standard safety equipment has been added across the Kona lineup, including driver attention warning, lane departure assist, and automatic emergency braking and forward collision warning on every trim. Last year, these features were available only as an upgrade to the top-of-the-line Ultimate trim. The 12-volt power outlet in every Kona model has been replaced with dual USB ports for 2019. As for exterior colors, a new Sunset Orange option replaces last year's black-roofed silver model. Drivers who opt for the SEL trim can add the SEL Tech package to get a sunroof, Infinity sound system, and Hyundai BlueLink software. The Ultimate trim is the only Kona with an optional sunroof as a stand-alone add-on. If you've been holding off on buying an electric car because you wanted a model with a longer range, your moment has arrived. The Kona can travel up to 258 miles on a single charge, coming out far ahead of other affordable electric vehicles like the Chevy Bolt. The only vehicles with longer ranges, such as the Honda Clarity, are available at a much higher price point than the 2019 Hyundai Kona. In fact, the car's name refers to its ability to drive Hawaii's entire 225-mile Kona loop without the need for a recharge. The 2019 Hyundai Kona can be fully charged in just 54 minutes with a 75kW charger, possessing the largest battery pack of any non-Tesla vehicle currently on the market. With a 50kW charger, it takes only 75 minutes. Level 2 charging with a 240-volt AC outlet takes about 10 hours. The smart system also allows you to automatically charge the car overnight during off-peak hours for maximum efficiency. You can further boost the efficiency of your Kona by selecting one of four battery regeneration levels through a toggle switch right on the steering wheel. This allows you to determine the rate at which the vehicle's energy is recaptured by the battery. Every 2019 Hyundai Kona comes with either a 7-inch or 8-inch infotainment system. You'll enjoy the ability to mirror your smartphone right on the touchscreen thanks to standard compatibility with Apple CarPlay and Android Auto. Exciting tech options include wireless charging and a heads-up driver display. If you upgrade to the Bluelink software exclusive to Hyundai, you can take advantage of features like the app-based remote charge management and charge scheduling. Hyundai claims a zero-to-60 time of just 7.6 seconds and a top speed of 104 miles per hour for the 2019 Kona, much better than its class rivals. It is equipped with a permanent-magnet motor that gets an impressive 201 horsepower and 290 lb-ft of peak torque. The electric version of the Kona is available only in front-wheel drive, though you can upgrade to all-wheel drive in the gas-powered 2019 Kona lineup. If you choose the latter version of the Kona, you can select either a 147-horsepower four-cylinder engine with the base model or a 175-hp turbo-four in higher trims. You'll have 19 cubic feet of trunk space to play with, which is more than most of the Kona's class rivals. It expands to 46 cubic feet when the rear seats are folded flat, creating more than enough room to pack for a road trip. Not only does the Kona come in an all-electric version, but its gas-powered trims earn leading fuel economy numbers among subcompact crossovers. You'll get an EPA-estimated 27/33 city/highway miles per gallon when you opt for the base engine with front-wheel drive. Reviewers say the 2019 Kona provides a fun-to-drive experience that rivals even the sportiest subcompact crossovers. If you choose an all-wheel-drive model, you'll find it can more than hold its own on bumpy terrain. Hyundai backs the Kona with one of the best warranties in the auto industry: a five-year/60,000-mile limited warranty and a 10-year/100,000-mile powertrain warranty. This crossover also boasts a rare above-average predicted reliability rating from J.D. Power and Associates. In addition to the new standard safety features added to every Kona trim for 2019, the vehicle also comes with a standard rearview camera. It can also be upgraded with other cutting-edge driver assistance systems, including blind spot monitoring, rear cross traffic alert, rear parking sensors, and lane change assist. Based on its outstanding crash test performance, the Kona has been given the highest Top Safety Pick+ designation from the Insurance Institute for Highway Safety. However, the Kona has not yet been tested by the National Highway and Traffic Safety Administration. Although it's still in its first generation, the 2019 Hyundai Kona has already garnered notice from auto industry experts. The Automatic Science Group gave the Kona its Best Economic Performance and Best 5 All-Around Performance awards for its combination of innovation and value. It was also named the 2018 Texas Auto Writers Association's Subcompact SUV of Texas and the Best Green Car of the Year by the New England Motor Press Association, won the Best EV Car award at the 2018 Miami International Auto Show, and received a silver International Design Excellence Award from the Industrial Designers Society of America. The Kona was named highest in overall satisfaction in the J.D. Power 2018 U.S. Tech Experience Index (TXI) Study for its innovative infotainment system. Finally, the Kona was named one of the coolest new cars under $20,000 by Kelley Blue Book. If you regularly transport adults or tall teens in the rear of your vehicle, you might want to go with a crossover that has a bit more room in the back. Several reviewers note that headroom and legroom are cramped in the rear of the 2019 Hyundai Kona, but this may not be a consideration if you rarely travel with full-sized passengers. Some also note that the quality of the interior contains more hard plastics than expected. Some reviewers find that the funky, distinctive appearance of the Hyundai Kona is just a little too funky for their tastes, especially when drivers choose the bright lime green exterior. Others, however, find the 2019 Hyundai Kona to be a breath of fresh air in the sometimes-staid crossover category. Controversial elements include the trendy floating roof design and the boxy shape inspired by the SUVs of the mid-1990s. You might find that you prefer a more traditional-looking vehicle. The other electric vehicles at the 2019 Hyundai Kona price point are the Chevy Bolt, which has a range of just 238 miles compared to 250 for the Kona, and the Nissa Leaf, which reports a 151-mile range. It also beats out the 220-mile range of the much more expensive Tesla Model 3 sedan. Although it falls slightly short of the Bolt's 119 MPGe fuel economy rating with an EPA estimate of 117 MPGe, it's better than the Leaf's rating of 112 MPGe. When it comes to gas-powered competitors, few can match the all-around excellence of the 2019 Hyundai Kona. You'll find that the Mazda CX-3 is a bit more athletic than the Kona, while the Honda HR-V gets better gas mileage. Whether you're looking for a gas-powered crossover or a state-of-the-art electric vehicle, the 2019 Hyundai Kona delivers everything you're looking for and then some. It's a great buy among a class of vehicles with best-sellers like the CX-3 and HR-V, more than rising above the competition to provide a truly unique automotive experience.